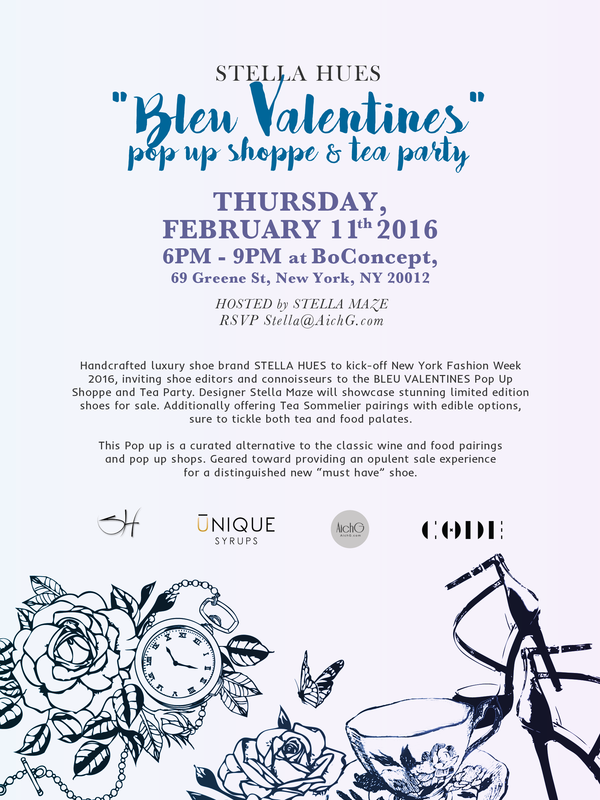 What: Handcrafted luxury shoe brand Stella Hues to kick-off New York Fashion Week 2016, inviting shoe editors and connoisseurs to the BLEU VALENTINES Pop Up Shoppe and Tea Party. Designer Stella Maze will showcase stunning limited edition shoes for sale. Additionally offering Tea Sommelier pairings with edible options, sure to tickle both tea and food palates. This Pop up is a curated alternative to the classic wine and food pairings and pop up shops. Geared towards providing an opulent sale experience for a distinguished new “must have” shoe. Tags: NYC events, NYFW, Pop Up, shoes, stella hues, tea party. Bookmark the permalink.